Hurricane Michael Update: We will post detailed information on the impact Hurricane Michael had on our vacation properties very soon. Please be patient with us as we evaluate the full impact and assess the situation. Kick Back And Enjoy The Beach Life In This Family Friendly Beachfront Condo! The condo was roomy and spacious. We stayed in the condo for 4 nights. It was spacious and really comfortable. The facility was clean and quite. Very enjoyable stay. Awesome Family Vacay! Great place to visit with family! Love the master bath with dual shower heads!!! An Anniversary To Remember Hubby and I went down for our 30th Anniversary. 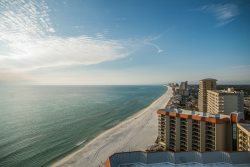 We have been visiting Panama City Beach at least twice a year for the last 30 years. Never have we stayed in a more luxurious and relaxing condo than this one. Donna and Jen at VIP went above and beyond to make sure everything went as smooth as possible. These two are as good as they come, which makes it easy for us to come back to VIP year after year. Worlds most beautiful beach! And a really nice condo. Condo was very neat, clean and comfortable. King beds in all 3 bedrooms was perfect for the 3 couples and everyone slept great as the beds were very comfy. 2nd floor location puts you right on the beach while sitting on the balcony. Would definitely stay here again! Awesome condo Clean condo. Great views. Well equipped. Would rent again. Very good Very clean and comfortable. One small complaint is that there was no coffee, Kleenex or extra toilet paper. We got in late and didnt have coffee for the morning. Would definitely stay there again. Clean, well maintained condo - enjoyed our vacation very much Very nice condo - clean, well maintained, and has everything you need for an awesome vacation. Could not ask for anything more. Donna and Jennifer were very professional and pleasant to deal with from start to finish. Reservation was smooth and they provided all information in a timely manner in the days leading up to the vacation, even calling to ensure that we had all the information. Once we got there, check-in was a breeze and we did not have any trouble getting into the condo. The condo is very spacious and has all amenities needed for a comfortable stay. Beds and furniture were clean and comfortable. The kitchen was well stocked and had all appliances and cookware to prepare meals easily. Refrigerator/freezer worked well but may need replacing in a couple of years. Washer and dryer were very convenient and worked well. The bathrooms were clean and updated. Only suggestion is to mention in the description of the condo that there is a Keurig 2.0 (and/or include a photograph) just in case guests want to bring their own coffee. The grounds are well maintained and parking is not an issue at all. Security is good with keycodes needed to enter the property and the elevators. The pools and hot tub are well maintained and access to the beach is good. All in all, an excellent condo and I would not hesitate at all to recommend it to anybody looking for a clean, comfortable place to have a stress-free vacation. Beautiful penthouse!! Wonderful property!! 10 of us fit very comfortably. VIP was incredibly helpful. Beautiful place to stay for vacation! It was such an easy arrival, no check in at the desk and everything was ready for us. The place was very roomy and clean. We had 8 people and we slept extremely comfortably. The place was truly a home away from home! Definitely would recommend and stay here again! Fantastic! Beautiful condo with all the amenities. We will definitely be coming back! Lovely beach getaway Very nice condo. Clean, safe, plenty of space, and well appointed. All you need for a great stay This is the view you want...with a beach that goes forever. Wonderful experience - and a comfy bed. The owners have kitted out the apartment with everything you could possibly need. Just unpack and enjoy. Lovely property- beautiful beaches. Plenty of room for everyone. Our family of 7 adults and one child thoroughly enjoyed our 5 days. Relaxing, beautiful view, well-appointed condo We found this condo to be everything as advertised. The balcony view encompassed the beach and the Gulf and was breathtaking at times. The view was always beautiful and relaxing and ever-changing, depending on the weather and time of day. The condo itself was very clean and well-equipped with sheets, towels, and everything you could possibly want in the kitchen. We appreciated the gated and coded parking and elevator service. We enjoyed our stay immensely. Week long stay Nice proprty right on the beach, the unit was pretty clean, well layed out, and comfortable. We had everything we needed for a pleasent stay, and will stay again when we return. No detail was overlooked! The owners took care of everything We loved staying at the Princess. The condo was amazing and views were stunning. First time at PCB in years and will be coming back soon. If you are traveling with teenagers you can easily check on them from the balcony if theyre enjoying the hot tub or one of the heated pools. We cant wait to stay here again! Nothing better than the privacy of a penthouse suite! Right on the beach, pently of space for everyone to sleep, eat, relax and enjoy everything Panama City has to offer. Loved the Condo!!! I took my grandchildren to Panama city Lower Lagoon for Spring Break. Loved the condo. It was in a gated community and even had to put code in for elevator so I felt safe allowing my older kids go to game room and even pool. The condo was clean and very well decorated. We were even left several coupons, which we used the free pizza the first night of arrival. Will book again. Repeat customer and we love VIP and the Princess Third spring break with VIP and The Princess and we love it. Condo is clean and well outfitted the building is great and gives a good safe secure feeling with small children and young teenagers in our group. We will be back again next year. The beach is wonderful and feels private and not crowded. The location is great with little traffic to get out and about. The condo was wonderful. We really enjoyed our stay. VIP staff were so helpful. We will stay again. Vacation Of Our Dreams Thank you for allowing us to stay in luxury for an amazing vacation. We found the condo outstanding! The state of the art kitchen provided us with all the tools we needed to prepare many of our family meals. It was spacious and well laid out. Nine of us, three generations, ranging in age from 2 to 64 spent 5 nights here very comfortably. There was plenty of room for all of us to find privacy when needed, and gather together in comfort. The view from the balcony which is shared from two of the bedrooms and the living room is beautiful. The beach chairs made for an easy day spent in the sand and sun. We had a great time. Good care by Jennifer and Donna. When we walked into the condo, the curtains were open. The gulf view was outstanding! Each bedroom had its own bathroom. The living and dining rooms were combine. The large patio was wonderful. We enjoyed the beach and Cory was great. Three pools! Very nice! We really enjoyed our stay! We only had one issue and that was the AC went out. They were very nice about it and offered us another room for the night until they fixed ours. Donna was so sweet and so was her husband. We would definitely stay again. Great view and very spacious We enjoyed our stay. Everything was clean and everything we used was in working order. We ended up being a small group and loved all the space especially the 3 bathrooms! Thanks for the free beach chairs and free coupons! I also liked the easy check in and check out. Gorgeous view, big rooms, has everything you need for your stay. It was great. Would not want to stay anywhere else.